1. 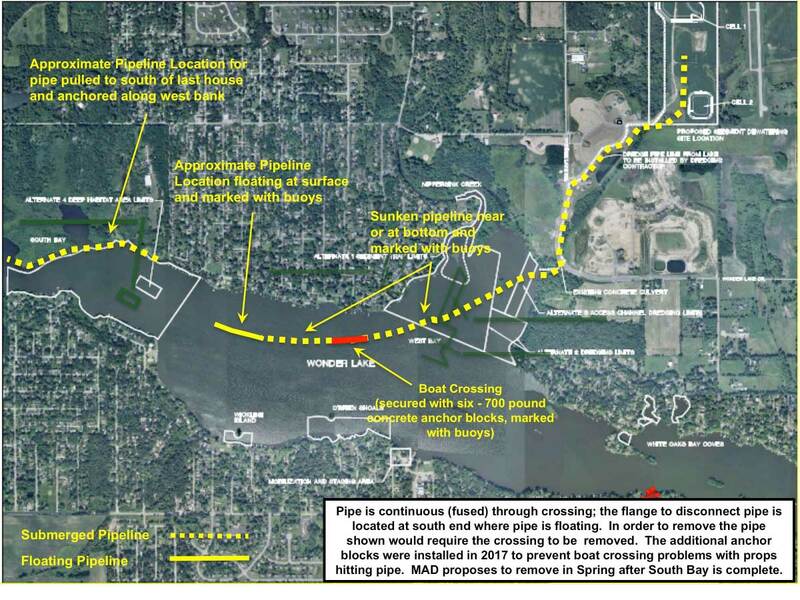 Any winter lake user should use extreme caution when in the vicinity of the floating pipeline (as shown below), roughly between Wickline Islands on the east and the Highland Shores beach on the west. Winter lake users are also reminded of the presence of the rip-rap “collars” around Wickline Island and O’Brien Shoals. 2. Lake users are also advised that the increase in water depths where dredging has already occurred could cause changes in how ice forms in those area, as well as ice thickness formerly encountered in those areas. 3. On the afternoon of December 13th, the MPOA was contacted by residents along the Nippersink Creek inlet who were noticing a potential spill of an unknown material, resulting in foaming and discoloration. Local authorities were notified, including the Illinois Environmental Protection Agency (IEPA). I met with IEPA the following morning to conduct an inspection, however, due to the unsafe ice conditions, none of this material could be collected for analysis. Similar material was also observed upstream of the Thompson Road bridge, suggesting that the source of the material was upstream of the bridge. The MPOA will have on-going discussions with appropriate agencies to make sure that appropriate actions occur in the event of a future spill, as well as to help prevent future spills though public education. 5. As part of the dredging contract, the dredging contractor is required to hire an independent surveyor to verify that the specified dredging depths have been achieved. 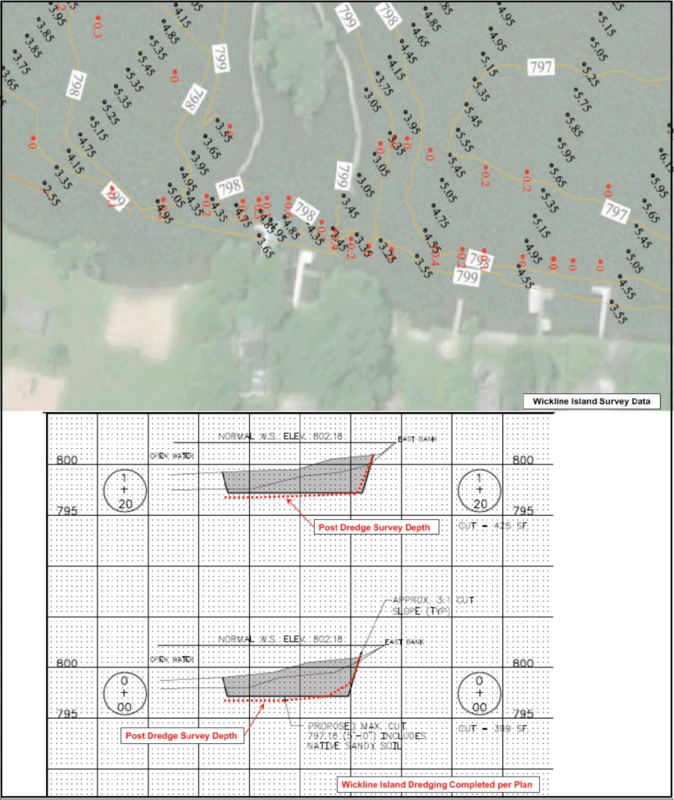 The surveyor takes hundreds, if not thousands, of measurements in each dredged area, such as shown in the Wickline Island detail below. That survey information is then compared against the project plans to confirm that the design dredge depths have been achieved, or where some touch-up work might be required. 6. It is important to note that if the dredging contractor dredges deeper than the contract design depth, the MPOA does not pay for that excess volume. To date, the survey data shows that portions of South Bay were dredged up to 0.75 feet deeper than required. While that may not sound like much, it has resulted in an additional 13,669 cubic yards of sediment removed from the lake at no charge to the MPOA.